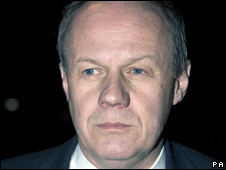 The arrest of Tory frontbencher Damian Green as part of an inquiry into Home Office leaks was "not proportionate", an official report has found. Ex-British Transport Police chief Sir Ian Johnston said the leaks amounted to "embarrassment" for the government but did not threaten national security. Sir Ian was asked by the Met Police to review the Home Office leaks probe. Mr Green, who was not charged, was held for nine hours in November, and his home and Commons office searched. It prompted uproar in the Commons, where MPs questioned why police had been allowed to raid a Parliamentary office without a warrant - procedures were later tightened up. There were also concerns that the police action represented a fundamental breach of MPs' right to hold the government to account. The shadow immigration minister's arrest followed a number of high-profile leaks dating back to 2007 including a memo to one minister revealing that an illegal immigrant had been working as a cleaner in the Commons and an e-mail about the fact illegal immigrants had been cleared to work as security staff. Sir Ian says in his report: "In my view, the manner of Green's arrest was not proportionate because his arrest could have been carried out on an appointment basis, by prior agreement, and when he could be accompanied by his legal representative. "I recognise the significant political context in which the leaks occurred and the professional anxiety they caused within the civil service. "However, I regard the leaks for which [Christopher] Galley can be clearly held responsible in law, as amounting to 'embarrassment matters' for government. "I do not think, from the material presented to me, that the leaks in themselves are likely to undermine government's effectiveness." Mr Galley, the civil servant arrested for leaking Home Office documents to Mr Green, was not charged but was later sacked for gross professional misconduct. A separate review of the case was carried out by Her Majesty's Chief Inspector of Constabulary, Denis O'Connor, who told reporters officers were operating in a "super heated" political environment in which they feared being "damned if they did, damned if they didn't". "They were concerned that, if they stopped, their impartiality would be questioned," he said. The reports show that a senior Cabinet Office official wrote to the Metropolitan Police in October last year asking for police to examine the leaks in a letter which stated that "considerable damage" had already been done to national security. Mr O'Connor said this prompted officers to continue their inquiry beyond the point at which they could have stopped. He told BBC Radio 4's World at One that police should only investigate cases involving "national security or those that affect the wellbeing of this country", rather than those which were simply "embarrassing" for the government. Mr Green said: "This report reveals that the excuse of 'national security' used to arrest me was entirely bogus. The police were misled about the security risks by a senior official in the Cabinet Office, which is itself very disturbing. "Then the police themselves used covert recordings to bug my conversations with officers, which is only legal in terrorist arrests. The more we find out about my arrest the more disgraceful it looks. "Once the authorities received the Johnston report in December it must have been obvious that no successful prosecution could be mounted. Why did I have to wait another four months to be cleared?" Conservative leader David Cameron said he had always thought Mr Green's treatment "extremely heavy-handed". Mr Cameron, speaking during a visit to Bedford, said: "I was always clear that what Damian Green was doing was part of his job. "He was calling the government to account, he was holding them to account for the things they had done, the mistakes they made." Liberal Democrat home affairs spokesman Chris Huhne said: "It is disgraceful that the Government has exaggerated national security concerns in order to play politics and hide its own embarrassment. "The police should not be abused for political ends. It was ridiculous that they were involved in this case at all as it should have been handled as an internal Civil Service disciplinary matter."